The economic recovery has faltered. The sovereign debt crisis in Europe is generating the development and approval of austerity budgets. Unemployment is rising and even bankers are getting made redundant! The chances are that this will continue to have an adverse impact on growth and hence the willingness of people to spend. Even those in jobs and with few money worries are beginning to behave in a cautious way. The preoccupation of many artists in 2011 has been on disappearing sales. Artists who have sold consistently well in the past have seen their exhibitions do less well than usual, galleries continue to close, sales dry up and their income takes a massive knock-back. For others, 2011 has not been one of their better years and there is some optimisim still around - however this is also tinged with the recognition that the current situation may drag on for years. On the other hand there are still artists who are selling and there's a need to learn why they're having a different experience within the current context. I'm hoping to develop a series of posts in 2012 which begin to look at what works and what doesn't in terms of marketing art. If you have good news to share please get in touch! Art is not divorced from the rest of the economy - no matter what some commentators say. That's particularly true at the high street level. The major issue for 2011 was the loss of public funding due to the budget adjustments which had to be made for all the money which was pumped into shoring up the banks. The bankers still get their bonuses and we get the austerity budgets and service cuts! My own feeling is that towards the end of 2011, the art economy woke up to the fact that much of the civilised world is heading into the second part of a double dip recession. That's if it isn't already here. This time around one gets the sense that people understand that recovery is not going to be fast. That's partly because at a macro level the sovereign debt crisis in various prominent countries is disturbing. When the credit rating agencies start talking about reducing the credit worthiness of important countries we should all be worried! I correctly predicted that in the UK we would get tax changes to make it easier to support the arts. Announcements were made about plans to simplify gift aid and reduce inheritance tax for those who pledge 10% or more of their legacy to charitable or cultural organisations. The government also started to consult on making gifts of art tax deductible. We started the year with everybody knowing funding for art via grants would be slashed. The Arts Council had to live with a 30% slashed from its budget and work out which organisations in the UK would get funding in 2011 - the big question was who would lose out. March provided the answers. Leadership was identified as lacking. The Parliamentary Select Committee on Culture criticised the Arts Council for "spending far too much on itself" - Arts Council told to sell off masterpieces in damning report by MPs. Other reports indicated that the Arts Council lacked the competence to commission and fund major projects - and compounded this by ignoring expert advice. It's really not the way to endear yourselves to a government when budgets are tight or to provide leadership for other arts organisations. ACE ignored the fact/didn't interrogate the fact that both the concept and the leadership of the project was inadequate. They gave it enormous sums anyway; but then found themselves so sucked in that they almost felt they had to make the Public succeed at any cost – which was impossible, given the flawed set-up. The winners and losers at a regional level within the UK were announced at the end of March. Around about a quarter of losers were located in London. The offset was that an average of only 15% was taken from front line organisations (with the rest coming from overheads and back office functions) and 4 year funding guidelines were announced for the first time. 2011 was supposed to be a year of corporate philanthropy in the UK. The aim was to stop the reduction in giving to the arts experienced in recent times. The government wanted organisations to go after match funding with Michael Portillo in charge of the new scheme (which might explain why I keep seeing him in galleries!). I've not seen a lot of evidence that this scheme is a success as yet. Instead what I have seen is a number of companies failing to continue existing sponsorship arrangements or pulling out of sponsorship of exhibitions/prizes at a late stage. Personally I think more effort should be employed in getting "bad" companies to redeem themselves through extracting lots MORE funding out of them for art! 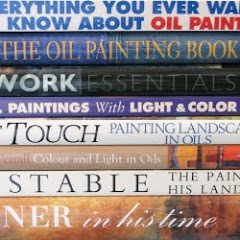 I am absolutely at one with view expressed by Jonathan Jones (Jonathan Jones on Art) in relation to the notion that BP should not be allowed to sponsor art - Slick art sponsorship: why shouldn't BP pour oil money into the Tate? Art has always needed the sponsorship of the rich and the powerful. However the rich and powerful do not always behave well or do good things. Should we therefore refuse their money until they start behaving? My own view is that those who want to stop sponsorship by banks etc should identify where the replacement funding is going to come from or what should be cut because the sponsorship funds are turned away. Additional fund certainly won't be coming from the taxpayer. While protests around the world this year, from Wall Street to Tahrir Square, have picked the right causes and enemies, the BP art campaign is mistargeted, misconceived and massively self-indulgent. 2012 PREDICTION: The double dip recession will arrive (if it hasn't already) and may well continue all year. That's when it gets bad (2008), gets better and then gets bad again. We're now entering the second round dip of depression. My gut feel is that this could be a long one with a slow recovery. Current indications are that it's going to be affecting far more people this time around. Growth has slowed and will technically become negative growth during the recession. Unemployment has already started to rise significantly. The lack of spending in countries with austerity budgets will impact on those who supply goods and services to them (hence the notion of "we're all in this together"). In terms of retail, it's expected that high street shops and those selling non-essential items will hit a bad patch early in the New Year. There's every chance that after credit card bills for Christmas arrive, those retailing art will find it bleak from February onwards. The main problem at the moment is nobody is confident as to when this will end. 2012 PREDICTION: Sales at the top level will be "bumpy" Sales at the top level of the economy - via the major art auctions - have been strong for most of the year but there are signs that the urge to spend is receding. In the latter part of the year works by very popular contemporary artists have NOT reached reserve prices at auction which would have been no problem a short while ago. Maybe the double dip recession is beginning to impact on the wealthier members of society? 2012 PREDICTION: Sponsorship will continue to be a victim of "downsizing" by smaller companies. 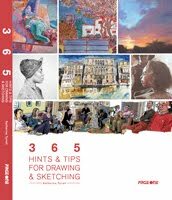 It may well be that your art society or local exhibition will suffer and you probably need a plan for "what if". 2012 PREDICTION: Lots of effort will be applied to working out how to make it easy for people to pay. For example, paying a small sum each month is a lot easier to do than to pay out the full price of a painting. 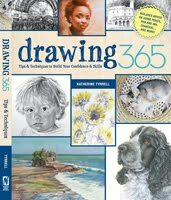 2011 PREDICTION: There is a renewed interest in crafts and heritage art. ACCURATE Grayson Perry has had a very successful exhibition at the British Museum and some considerable exposure in the media. 2011 PREDICTION: Specialist genres will continue to be relatively stable in terms of sales. PARTIALLY ACCURATE. This was a repeat of my prediction for 2010 and 2011. 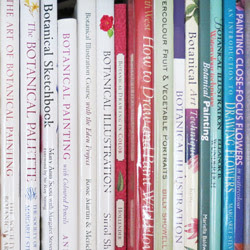 Certain genres (wildlife art, animal art, botanical art and miniature art) all have an established collector base who are passionate about the art. My own observation (I look at red spots!) would tend to suggest that it's proving more difficult to match past sales records - although exhibitions dedicated to a genre are typically still doing better than other types of art. Those who jealously guard their mailing lists of past purchasers and cosset them with Buyers' Previews seem to do rather better. 2011 PREDICTION: Fewer commissions for portraits of individuals associated with publicly funded institutions. UNSURE The commissioned paintings I saw in 2011 were the result of commissions mainly undertaken prior to current concerns about the double dip recession and the funding cuts. 2011 PREDICTION: Some artists selling paintings in the £10,000 - £20,000 may feel the pinch. UNSURE What I have seen instead is a lot of price hikes by artists who have historically charged less. It took me a while to work out what was going on. I'm assuming this results from a loss of sales and a strategy for continued income. I'm seeing more than a few Artists who usually price under £1,000 and between £1-5k now pricing well above past prices. The strategy seems to be to make their art look more like art which should be bought by rich people. They're trying to move away from those whose assets and incomes are currently being squeezed and are instead chasing the wealthy collectors who won't buy cheap art. 2011 PREDICTION: Paintings will become bigger and more colourful again. The theory is that art which incorporates warm / sunny / feel good colours helps to make people feel good and hence is more likely to sell. ACCURATE Feel good art definitely sells. One of the prime examples for me was a lovely sunny Bonnard which I sketched at Christies - which went for a record price. I've also seen much larger and more colourful paintings at some art society exhibitions. Exhibitions of small pieces in dull colours are depressing - and nobody buys. 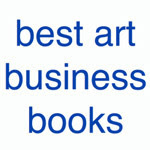 This is a review of the business of art - hence predictions do not relate to those who produce art for their personal pleasure and have an income or other support independent of any profit they generate from their art. 2012 PREDICTION: More artists will need to analyse the real costs and benefits of different media and formats. Artists can't afford not to know what sort of return they get on the different types of art they generate. The aim will be to find which approaches involve them in virtually giving work away for free (after all relevant costs are counted) and which generates the best return and least risk for the amount of time and effort and materials invested. I predicted that technology and galleries would get cosy however progress has been painfully slow. Which is surprising given how fast other areas of the economy have grasped that the whole world is going online - and huge numbers are online and mobile. I'm left feeling that retail galleries lack expertise for retail in the 21st century and need technical help to get them set up with basic social media. Which represents income generating potential for the artist who's also a techie. 2011 PREDICTION: iPad portfolios PARTIALLY ACCURATE - I've certainly seem more artists using an iPad as their portfolio - but I don't think this notion of a beautiful and very portable portfolio has caught on as yet. It works the other way round too - galleries showing artists the different ways they can hang a gallery. 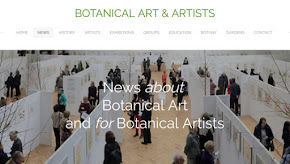 2011 PREDICTION: more and more art gallery blogs PARTIALLY ACCURATE - The notion that a blog is just an online version of a gallery newsletter has not yet caught on. However the more contemporary and switched on Museums have developed a blog eg Turner Contemporary in Margate. I think the problem might lie with competence around technology within galleries! Where it exists progress is being made and I'm hearing anecdotes which suggest good things happen as a result. It's difficult to see how progress will be made in galleries that lack the confidence and the competence to write a blog. 2011 PREDICTION: more dedicated exhibition blogs which feature art and artists in individual blog posts. PARTIALLY ACCURATE - Galleries that have switched on to the opportunities offered for dynamic marketing are doing it. 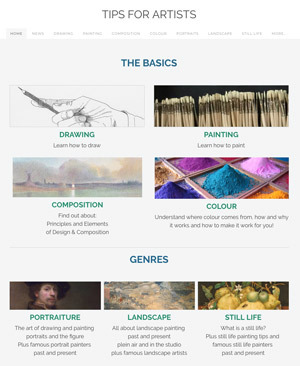 A good example is the Beside the Wave Gallery blog based in Cornwall which previews artists on a blog prior to an exhibition and also writes about their work after an exhibition or art fair in terms of work which attracted particular attention. It all helps to warm up the collector! 2011 PREDICTION: more smartphone/iPad apps for major art museums and galleries PARTIALLY ACCURATE - again steady progress but it's far from routine. Also museums and galleries need to note that to be effective they must produce an iPhone AND an android version. Some major new regional galleries - both designed by David Chipperfield - and both totally switched on to the new way in which people relates to organisations and cultural opportunities. The switch away from London towards funding regional art galleries makes complete sense if the two below are anything to go by. 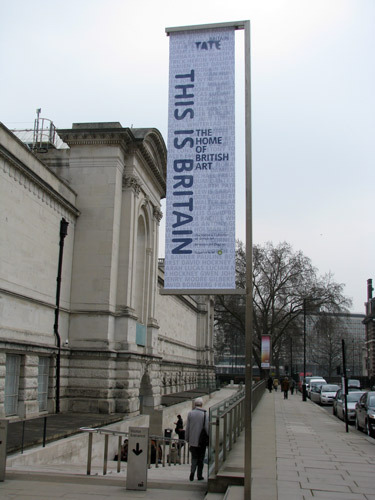 Importantly it also recognises the scope that Art has to bring a real economic benefit to an area. They seem to set a good example. Turner Contemporary in Margate which opened on 16 April 2011 - it has been community driven project relating to regeneration and has a community oriented blog . It also has a very lively Facebook page and has accounts on Twitter, Flickr, Vimeo and Foursquare and seems to be progressively taking over the local community radio in Kent! It's also very much engaged with events for local people of all ages. the big push to digitize the government art collection and other collections. The recession is both a threat and an opportunity. Riding out the waves of the double dip recession requires a disposition to think strategically and implement significant change to gear up for a new business model. The level of sovereign debt crisis means that a recovery in the economy may be a long way off. The consensus seems to be that the story of 2012 will be about how economic growth fails to materialise and the economic recovery . keep costs down by repackaging the in-house collection as an exhibition - and then charging people to see it! promote bookable exhibitions. This is seen as a way of reducing the crush which exhibition visitors have experienced on occasion in the past. It also means that they get the cash flow going early which helps to absorb the costs of expensive exhibitions. 2012 PREDICTION: more art will be sold through dedicated art fairs and more artists will aim to link up with one. The art fairs are popular with collectors, they get to see a lot of art in once place. While they have their ups and downs I've heard good things this year from artists who have been exhibiting at the better calibre ones. Good galleries now compete for a place at the good fairs. 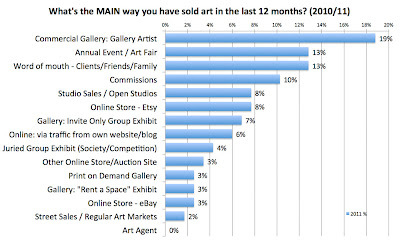 2012 PREDICTION: more galleries will close but more artists may start selling art on the high street. Gallery closures will be driven by collectors preferring art fairs, the decline in footfall on the high street and the fact that people are being very careful with their cash. Sales have dropped significantly for many artists. However initiatives to regenerate the high street in the UK may well help art galleries and/or artists with imagination and the gumption to "have a go". These are the key recommendations. The notion that it should be easier for people to become market traders offers one option for the sale of art - as does the imaginative use of empty shops. 2012 PREDICTION: a few galleries will begin to explore the latest feature of retail marketing ie multi-channel marketing (eg see it online, order it and pick it up in the store of your choice OR see it in a store and order it and have it delivered to your home). My gut instinct says that this is a good idea for art - but probably rather difficult to do well. Is it technologically competent? Does it have a decent website? Does it have a blog? Does it go to good quality art fairs? 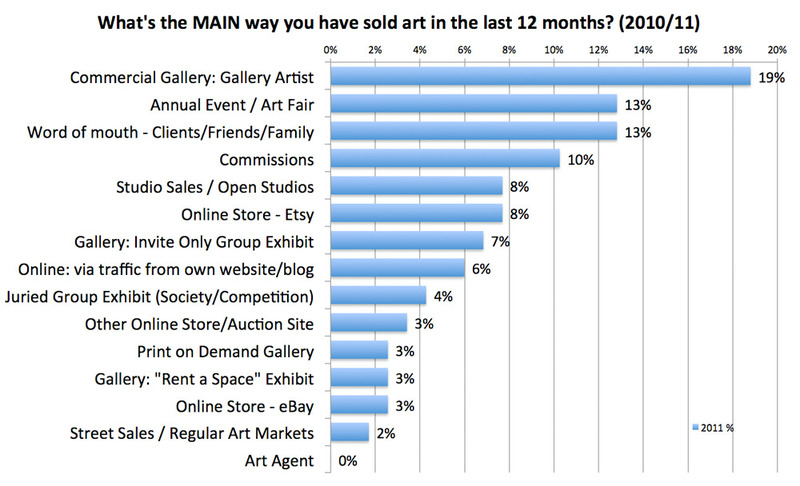 What's the main way you've sold art in the last 12 months? 2011 PREDICTION: Regulation will get to grips with business practices online - improving compliance with tax law and reducing the scope for lost taxation - I've not heard anybody moaning so I'm wondering whether the tax people have bigger fish to fry! 2012 PREDICTION: artists will develop/improve their branding and how artists present themselves to the world To be memorable involves more than just painting a great painting. 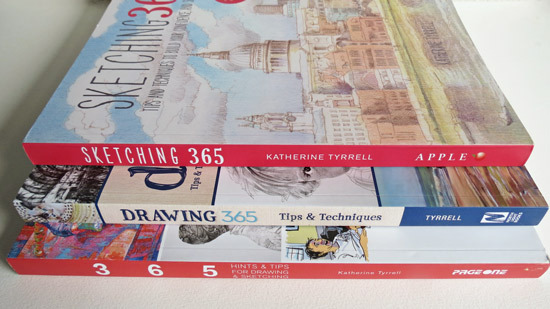 Artists wanting fodder for their thought processes may well find sustenance in my collection of "resources for artists" websites - which can all be found in How to sell art online. 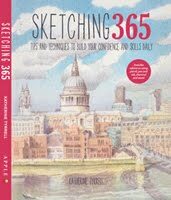 2011 PREDICTION: more and more high street stores which stock less and less ACCURATE - the craft hobbyists are taking over. Cy Twombley - an American living in Italy and regarded as a considerable painter by many - obituary.